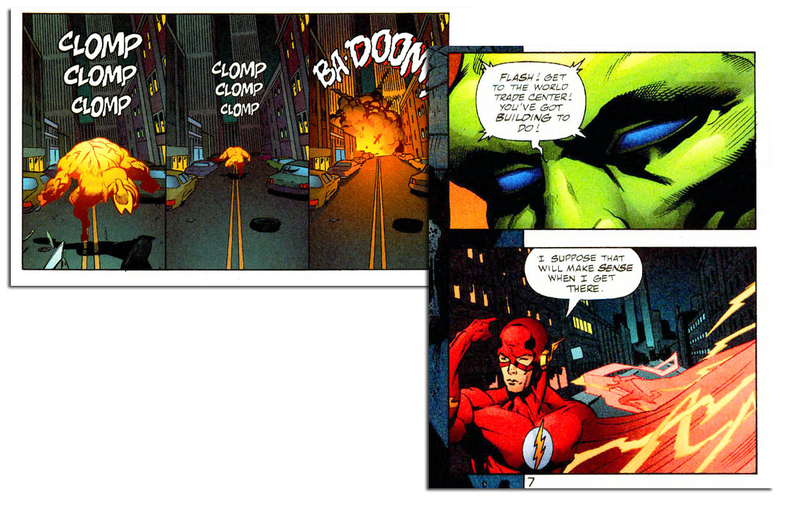 More specifically, what I noticed while reading some issues of Green Lantern from pre-9/11 in 2001. It all began when I started reading the story arc beginning with, for me and my collection, Green Lantern Vol. 3 issue 132 from January 2001. An innocent enough date. 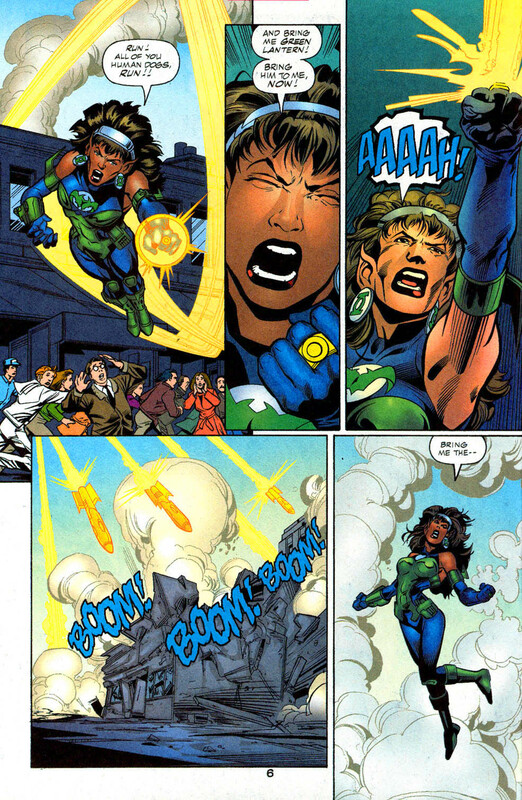 The story goes like this: A crazy, insane person named Fatality, who is hell bent on revenge, receives a Yellow Power Ring from the anti-matter universe to help her reap her revenge against John Stewart for accidentally destroying her planet. She is eventually disarmed (literally). At first, I didn’t think anything more of it. It was a good read with a somewhat surprise twist at the end. That twist was the fact that the ones who gave Fatality her Power Ring were looking at another to bear one. Only this person was more insane and had less of a moral boundary than Fatality. Fatality tries to draw out John Stewart. With Fatality out of the way, the next Yellow Ring bearer, a mental patient by the name of Nero, wages an all out “holy war” against those who he has deemed impure for this land. The issues that follow (issues 133-136 for those playing at home) show Nero attacking New York city. People are frightened, not knowing what to do. In one still, school children and a teacher cower in fear as 3 of Nero’s yellow constructs walk towards them. Then Batman throws a rock at one to distract them. 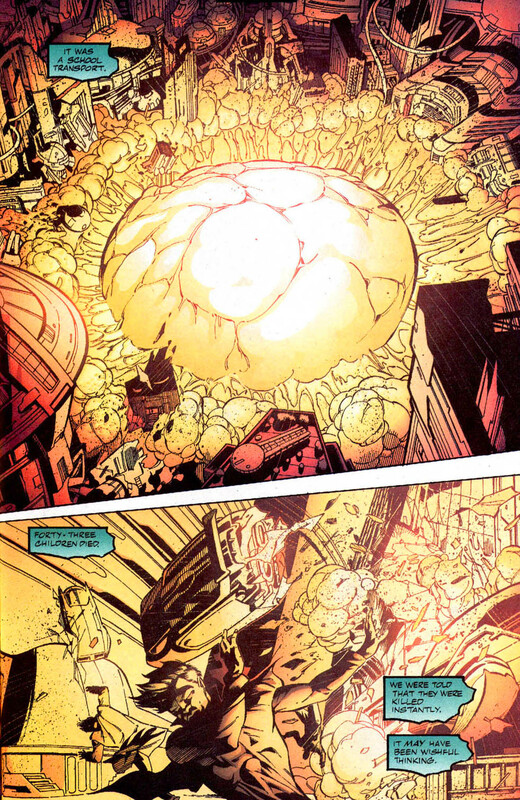 Then puts grenades in the constructs mouths thus blowing them up, but that’s beside the point. The depictions of New York city being under attack by someone who wishes to purify the land and to rid the world of those he deems impure really struck a cord. Nero even calls Kyle Rayner an infidel for trying to save Alan Scott’s/Sentinel’s life! Basically, anyone, or anything, that Nero saw as different than what he thought should be, he deemed as unholy. Nero calling Kyle an infidel for trying to save Alan. Perhaps the most disturbing image that I saw during the battle with Nero in New York city, was yellow constructs, produced by Nero, running at and crashing into the World Trade Center. Thankfully, Superman was able to freeze most of the sub-structure to keep the Towers stable long enough for Flash to arrive and to begin rebuilding what he could before being called away. It took me a while to fully realize what I saw. First, I looked at the date of when this issue was published; it was May, 2001. Four months before the attack. I was honestly a little disturbed, and it takes quite a bit to get me disturbed. The writers and artists had no clue that, in a sense, life would soon imitate their art. The Yellow Construct attacking the WTC. Until a terrorist attack happens. Five blocks away from the parade and celebration that was being held to mark the signing, a monorail transport exploded. Kyle and Jade were told that the transport was full of school children that were running 10 minutes late on a school field trip. If the school group had been on time, the bomb would have gone off right in the middle of the parade. This brings back memories of hearing in the news, almost every day shortly after 9/11, that over in the middle-east, similar things happening. 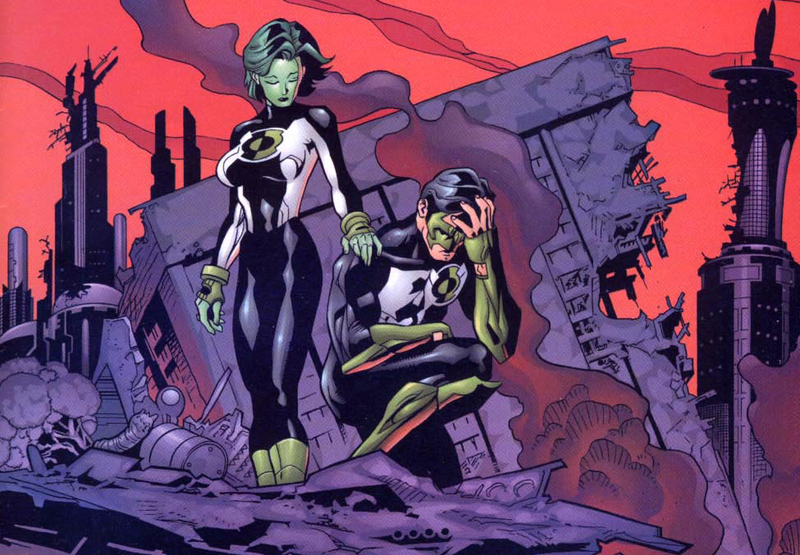 But, all of this in the Green Lantern, were written months well before anything happened. In issue 139, August 2001, Kyle and Jade take out the terrorist leader, and leave the planet to deal with the internal political ripples themselves. With no Corps to help them, there is nothing they can do (thanks, Parallax!). 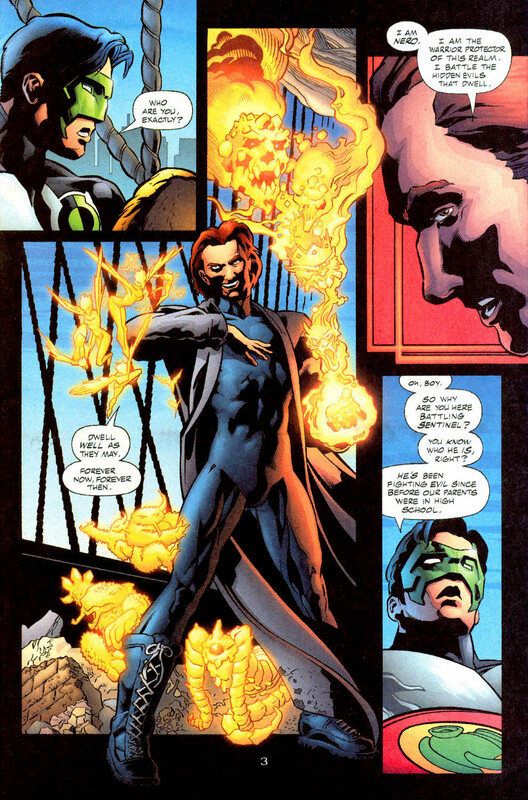 September, October, and all the way into November, Green Lantern had no further mention of terrorism or anything relating to 9/11, as far as I can tell. Issue 140, September 2001, was Sentinel/Alan Scott and Kyle play fighting, 141 from October 2001 was Jade and Kyle tracking down an arsonist only to find out that it was a group of super villains calling themselves Inferno, and issue 142 from November 2001 is that battle. No other mention of terrorism. Maybe in the December issue featuring the Joker… I haven’t read that one, to be honest. But, it was crazy to see for several issues things that paralleled what was going to happen, especially the attack by Nero on the WTC and New York. I felt that this was a strange enough coincidence that I felt was worth sharing. I do apologize to you, the reader, if this brought any sad feelings back. I know it did for me, especially when I was at work and was reading these issues. But, it is odd how life can imitate art. We here at The Uncommon Geek remember, and will never forget.